Sims et al (2007) found U250 to be equivalent to M223, but was not tested against M284, M379, P78 or P95. In addition, U250 is not identical to S31, S23, S30, S32, S33, or S24 nor has it been tested against these SNPs. P38 has never been found to be non-redundant with M170, M258, P19, or U179. The Y Chromosome Consortium in 2002 established the placement of P38 as I1. In I1b1a the designation P41.2/M359.2 means that these two SNPs are identical but were discovered separately. The listing is alphabetical, not necessarily in the order of discovery. Y-DNA haplogroup I is a European haplogroup, representing nearly one-fifth of the population. It is almost non-existent outside of Europe, suggesting that it arose in Europe. Estimates of the age of haplogroup I suggest that it arose prior to the last Glacial Maximum. Probably, it was confined to the refuge in the Balkans during the last Ice Age, and then spread northward during the recolonization of northern Europe following the retreat of the glaciers. I-M253/I-M307/I-P30/I-P40 has highest frequency in Scandinavia, Iceland, and northwest Europe. In Britain, haplogroup I-M253 is often used as a marker for "invaders," Viking or Anglo-Saxon. Within I1a, the M227 subclade is concentrated in eastern Europe and the Balkans and appears to have arisen in the last one thousand to five thousand years. It has been reported in Germany, Czech Republic, Poland, Estonia, Ukraine, Switzerland, Slovenia, Bosnia, Macedonia, Croatia, and Lebanon. I-S31 includes I-P37.2, which is the most common form in the Balkans and Sardinia, and I-S23/I-S30/I-S32/I-S33, which reaches its highest frequency along the northwest coast of continental Europe. Within I-S23 et al, I-M223 occurs in Britain and northwest continental Europe. A subgroup of I-M223, namely I-M284, occurs almost exclusively in Britain, so it apparently originated there and has probably been present for thousands of years. Athey et al, Resolving the Placement of Haplogroup I-M223 in the Y-chromosome Phylogenetic Tree. 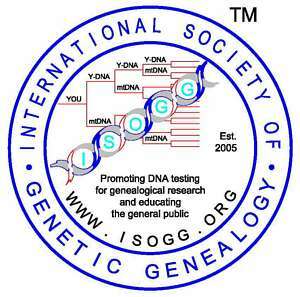 (pdf) Journal of Genetic Genealogy, 1:54-55, 2005. Rootsi et al, Phylogeography of Y-Chromosome Haplogroup I Reveals Distinct Domains of Prehistoric Gene Flow In Europe. American Journal of Human Genetics, 75:128-137, 2004. Underhill et al, Y Chromosome Sequence Variation and the History of Human Populations. (pdf) Nature Genetics, 26: 358-361, 2000. Y Chromosome Consortium (YCC), A Nomenclature System for the Tree of Human Y-Chromosomal Binary Haplogroups. Genome Research, 12:339-348, 2002. Email changed for Contact Person on 20 March 2007. Added M72 at I1a1a; added S62, S63, S64, S65, S66 on 8 June 2007. Added note on P38 under Notes on 8 June 2007. Added notation on I* and I1* that they were unobserved on 8 June 2007. Removed references to papers by Alonso, Behar, Cruciani, Flores, Kivisild, Nasidze, Shen and Valone as they neither define the structure nor add to the understanding of Haplogroup I on 8 June 2007. Added references to Underhill, Hammer, YCC, and Sheinfeldt on 8 June 2007. Added Ron Scott and Bob Waterouse references in Additional Resources on 8 June 2007. Added to third note to Notes on 17 October 2007. Copyright 2007, International Society of Genetic Genealogy. All Rights Reserved.